It's the moment of truth for NY City Opera. The company, which is fighting it's way back from the financial abyss, opened it's box office for single ticket sales on Tuesday. According to Crain's NY, early indications are good. Executives at NYCO report that half of the performances for the opening production of Esther were at 50% capacity from subscription sales, even before the box office opened for single tickets. They're all about boosting sales, though. In that vain, the opera is continuing its Opera For All program, offering a quarter of this season's tickets for $25 or less. Well, they say the third time is the charm. 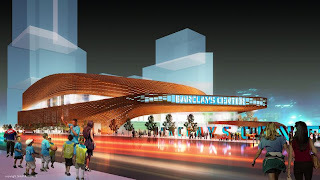 Let's hope so for the Brooklyn's Atlantic Yards... the cornerstone of which is to be Barclay's Arena. Originally the arena, like the whole of Atlantic Yards, was to be designed by Frank Gehry, but as you've all read here on A Liberal's Libretto, earlier this summer the developer of the project, Forest City Ratner, fired Mr. Gehry and replaced him with the Kansas City firm Ellerbe Becket, whose preliminary designs looked less architecturally appealing and more like a barn on the Kansas countryside. Yesterday, the developer released yet another batch of arena renderings, produced by Ellerbe Becket in collaboration with the young slash up-and-coming New York firm SHoP. The LA Times has a few thoughts on the third version, "which rather than banish the ghosts of Gehry's design seems in part to revive them". It's Back 2 Broadway month! According to a press release from The Broadway League, B2B month officially launched yesterday. 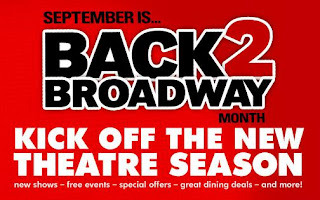 The events within Back2Broadway Month will celebrate Broadway overall, highlight the new season, and provide added value components for consumers including free events, talkbacks, concerts, interactive activities and more. Theatregoers and Broadway fans can enjoy numerous events including: the annual free concert Broadway on Broadway on September 13th, Broadway Salutes special event on September 22nd to celebrate those who have worked over 25 years on Broadway, Insider View Post-Show Talkbacks on Tuesdays, Broadway Tweet-ups, Broadway Open Call Karaoke, Broadway Open House Theatre Tours, SIRIUS XM "Live on Broadway" Lunchtime Concerts and Talent Panels on Wednesdays, Broadway Dance lessons in Times Square on Fridays, Kids Night on Broadway, promotions and much more. 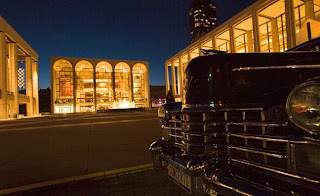 To get more information and a full calendar of events, visit ILoveNYTheater.com.